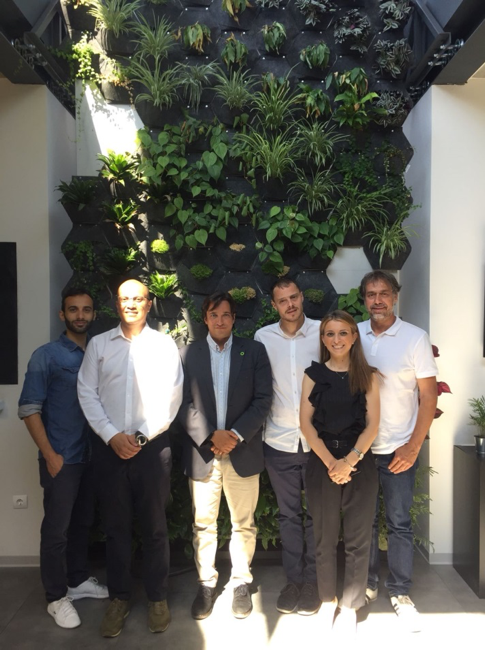 Madrid, 11/7/2017.- The #MUAC project, promoted by the Innovation and Technology for Human Development Centre (itdUPM), has obtained funding from the European Organization EIT Climate KIC within the Pathfinder call. The objective of this project is to study the benefits of an innovative system that uses vegetation to perform a biological purification of contaminated air in cities. The MUAC project (Modules for Urban Air Cleaning) is a Nature-Based Solution (NBS) for cleaning the air of cities. This consists of a tower with vegetation that integrates a new system of capture and filtering both particles in suspension and various pollutant gases. In addition, its constructive system allows to significantly increase the green areas in places with large paved surfaces. The researchers responsible for developing the project belong to a multidisciplinary team assigned to the Innovation and Technology for Human Development Centre (itdUPM) of the Universidad Politécnica de Madrid. The project also involves vertical gardening company VertiArte (as a partner in the proposal) and the company Altair, specialized in offering engineering solutions (which will optimize the structure). The purpose of the project is to develop an adaptable solution at an environmental level that actively contributes to the reduction of greenhouse gases, the island of urban heat and to improve the feeling of well-being of society (increasing green areas) while helping raise awareness about the need to improve air quality in cities. This project seeks to be an affordable solution that allows its scalability and replicability in different cities and environmental conditions. In addition to allowing public and private entities to make profits with the placement of the system, since the towers have spaces for advertising that can be rented. The MUAC uses a biological purification system, which works by introducing polluted air through the lower part of the module (through microperforated metal sheets), forcing its circulation around the inner wall with substrate where the particles are absorbed and the polluting gases are filtered. Finally, an extractor is responsible for expelling filtered air to the outside, allowing a continuous air flow of up to 20 m3per hour. The MUAC system has been designed to be an element of easy integration into the urban landscape of cities, since it can be placed on sidewalks, squares and other public spaces, due to the small surface it occupies (60×60 cm), allowing to significantly increase the green areas in places with little or no vegetation and finally be part of the initiatives that contribute to combat and adapt to climate change.